If you look at the banner towards the top of the screen, there's the "App" button to the left of the search box. If you go on there there's an FPS conversion scale, you can input exact figures yourself and also use the other functions to work out the energy output. The thing to remember though, is that just because heavy ammo makes the fps lower, doesn't mean it's a weaker gun, the heavier weight counterbalances the effect so if you shot someone it would still hurt them just as much. That's why it's so important everyone chronos with the same weight BB, because we're actually measuring the energy level, not the fps. 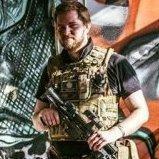 If you're aware of that already I don't mean to sound patronising, it's just that we get people reading forum posts without being actual members, so if they misunderstand something they read it can be misconstrued when they tell someone else later on, it's how a lot of stupid airsoft myths are started I believe. So it was just for the sake of the people who read this thread who don't know that.